A triangular-shaped alarm clock sits upright near the bed stand. The clock has a black and brown body with a brass finish. The design of the clock gives it an imposing stature, which only increases when it strikes wake up time. If anyone has trouble waking up in the morning, then this clock is your one stop solution to wake up on time. The imposing, triangular-shaped alarm clock is a Talking Dalek Alarm Clock from the sci-fi universe of the legendary time traveler, Doctor Who. Fans would know Doctor Who as the longest running science fiction series in television that began in the sixties and continues to air circa 2010. The Talking Dalek Alarm Clock is inspired by a race of extraterrestrial mutants called the Daleks that have constantly appeared on the show. Daleks have been portrayed as cyborgs inhabiting the planet Skaro. The cyborgs have a tank-like body and are known to be a very aggressive race that tries to conquer the universe without any pity or remorse. 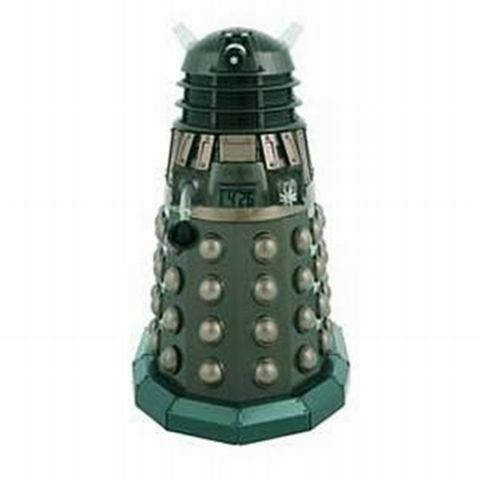 Daleks are devoid of any emotion with their favorite catch phrase being “Exterminate”. The tank-like cyborgs may not be the most popular creatures on the show, but they display all the attributes needed for a successful alarm clock. Which is, to wake you up. The mere sight of a Dalek Alarm Clock sitting near the bed stand should be enough to remind you what’s in store if you do not wake up when the Dalek clock commands you to. The Dalek Clock has a round black pump for a head and an armored body that rests on a brick base. The armored body has articulated brass pads and rounded brass semicircles attached to it. The clock sits right in the center of the heavy armored body. The cyborg clock is very easy to use and operate, not to mention extremely proficient in waking you up. Once the Dalek Talking Clock strikes the time you’ve set, it shouts “You would make a good Dalek”, “Exterminate,” or “You are an enemy of the Daleks, you must be destroyed”. This should wake you up from your dream slumber. In case you wish to silence the miniature Dalek on your bed stand, just press the pressure pads at the base of the clock. Additional features include transparent ears that light up when the alarm goes off. The Talking Dalek Alarm Clock is a really cool thing to have -especially if you are a sleepy head. One can avail this alarm at $39.99. Alarm Clocks can be weird and stylish. There are few other designs that you can look at such as Geeky Alarm Clock Smash Gadget and Lark Gadget.